CYP17A1 is the gene that encodes for the enzyme Cytochrome P450 17A1 ( or steroid 17-alpha-monooxygenase, or 17α-hydroxylase/17,20 lyase/17,20 desmolase) . It is found in the zona reticularis of the adrenal cortex and it localizes to the endoplasmic reticulum. It has both 17alpha-hydroxylase and 17,20-lyase activities, and is a key enzyme in the steroidogenic pathway that produces progestins, mineralocorticoids, glucocorticoids, androgens, and estrogens. 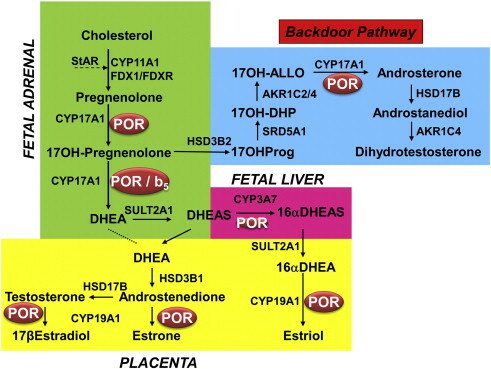 The mechanism of dissociation of cortisol and DHEA synthesis in aging depends on another regulator of 17,20-lyase of cytochrome P450c17 such as cytochrome P450 reductase. Cytochrome P450 oxidoreductase (POR) is an enzyme that is essential for multiple metabolic processes, chiefly among them are reactions catalyzed by cytochrome P450 proteins for metabolism of steroid hormones, drugs and xenobiotics. 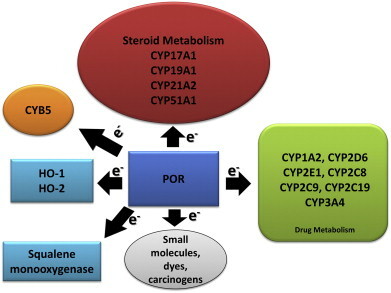 Mutations in POR cause a complex set of disorders that often resemble defects in steroid metabolizing enzymes 17α-hydroxylase, 21-hydroxylase and aromatase. Since our initial reports of POR mutations in 2004, more than 200 different mutations and polymorphisms in POR gene have been identified. Several missense variations in POR have been tested for their effect on activities of multiple steroid and drug metabolizing P450 proteins. Mutations in POR may have variable effects on different P450 partner proteins depending on the location of the mutation. The POR mutations that disrupt the binding of co-factors have negative impact on all partner proteins, while mutations causing subtle structural changes may lead to altered interaction with specific partner proteins and the overall effect may be different for each partner. 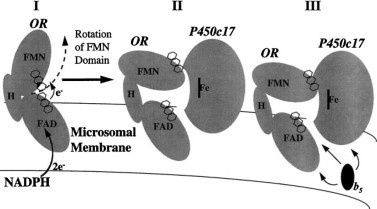 This review summarizes the recent discoveries related to mutations and polymorphisms in POR and discusses these mutations in the context of historical developments in the discovery and characterization of POR as an electron transfer protein. 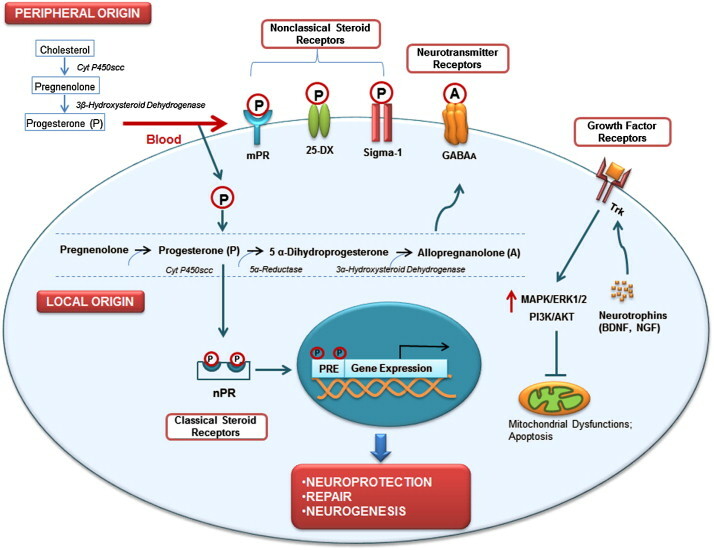 The review is focused on the structural, enzymatic and clinical implications of the mutations linked to newly identified disorders in humans, now categorized as POR deficiency. Proposed function of cyt-b5 in CYP17A1 catalysis. (I) NADPH transfers two electrons to POR. 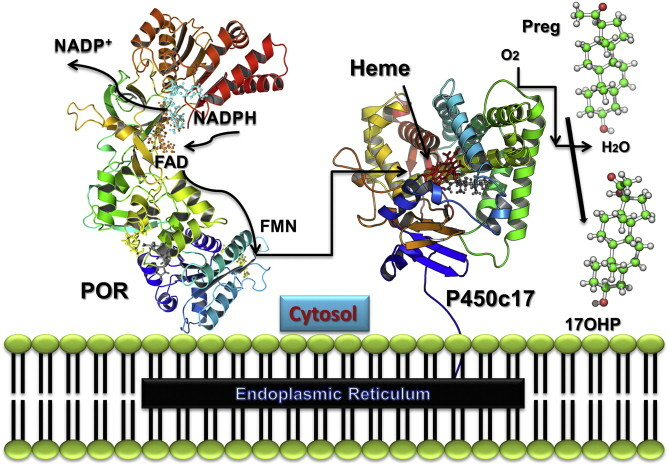 (II) FMN domain of POR rotates to dock with the redox-partner binding site on CYP17A1, resulting in the 17α-hydroxylation of the steroid substrate. (III) cyt-b5 acts as an allosteric effector to optimize the geometry required for the 17,20-lyase reaction. Reproduced from (Auchus et al., 1998). 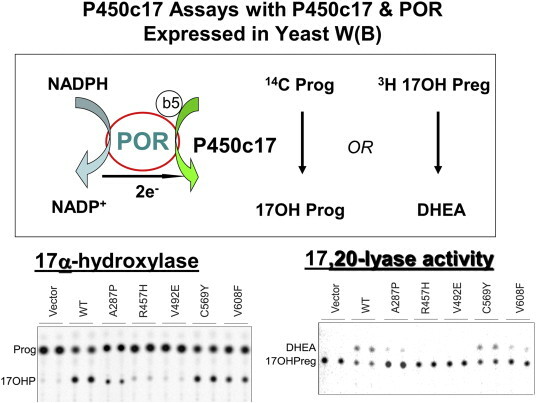 When expressed in bacteria, human P450c17 required either cytochrome b5 or phosphorylation for 17,20 lyase activity.